"Documentation: what I see now on the VCR happened months - soon to be years - ago, and here I see some more white hairs, and a gesture I've been trying to get rid of for years; and I'm trying to edit the pieces, to take the best and leave out the not-so-good (to hide that gesture), and create an image that will serve me. Why? why can't the image and I be identical, one and the same thing, and 'still' succeed?!" Click on to play the video clips using the site's media player (recommended). Click on to download the video clips to your computer (see notes below). Beethoven Blvd. via Abbey Rd. A documentary, beautifully demonstrating Roni's approach of presenting classical music to diverse audiences. Filmed and Directed by Yvonne Miklosh. Produced by The United Studios of Israel. 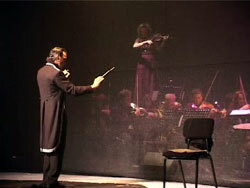 The show was created as a co-production between Clipa theatre and The Israel Philharmonic Orchestra, conducted by Roni Porat. A Theatre Concert. In a new and digital world where melodies have been long-forgotten, an old cellist auditions for "the music factory" and gets accepted. He is secretly committed to passing on the "last melody" to the next generations. Played by The Israel Stage Orchestra. 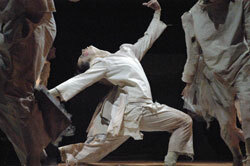 The production premiered in the Israel Festival 2004. 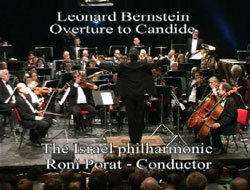 Roni conducting The Israel Philharmonic Orchestra on a gala evening in a concert dedicated to Leonard Bernstein. 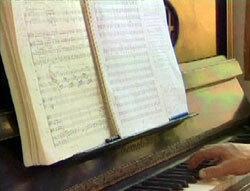 Roni has oppend the 2004 "Sounds of Childhood" Festival with Beethoven's Symphony No. 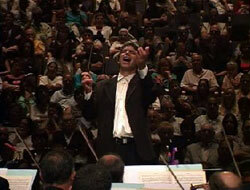 5, with The Israel Philharmonic Orchestra. Here you can view an excerpt from the first movement. All concerts are also available in broadcast quality and in full length. Video clips are in .wmv format and require Microsoft Media Player to play. If you have a fast internet connection, the video clips should start playing almost instantly. However, if you are experiencing dropouts or other problems while playing the videos, may we suggest to download the files first by clicking the download button, and to watch them on your computer. and choose "Save Target As..." .